There are times when I have to wonder why a kit is produced. This RS kit is a case in point. We already have the rather nice Hasegawa kit of this aircraft in this scale. Then I think about some outside influences. For instance, the Hasegawa kit is not always available. It is also not the most inexpensive kit at the moment and one has to consider that there might be improvements in the RS kit despite its short run makeup. So let's take a look at this one. It is very much like many of RS Models' kits in that it is a short run kit. It consists of a single brown plastic sprue that has been snipped to fit into a standard box. It also has a smaller sprue for the clear bits. No resin, no photo etch, which is fine with me. The inside of most of the larger bits have ejector towers that will need to be removed from some of them in order to get the parts to fit together. Mold seams are a bit large on some parts, but again, this is standard stuff for short run kits. The fuselage haves have nice sidewall detail, something the older kits are lacking. There is the standard interior, made of a floor, bulkheads, seat and control stick eith the instrument panel fitting to one fuselage half. The nose of the fuselage is a single piece so no upper and lower seam to fill. Wheel wells are molded into the lower wing half and have acceptable detail. Landing gear are fairly well molded and will look the part when done. The main gear doors are molded as a single piece so the builder will not have to layer the outer doors. Inner doors are separate. Wheels are a single piece. The radiator bath is separate and has a blocking plate. The kit offers both short and long prop spinner but does not tell you which is used with which markings option. Nor can you tell from looking at the painting diagram. Instructions are more than adequate and do provide color info during painting. I am t hinking that the interior should be the dark blue normally found in these planes, but the instructions call for a dark grey. Markings options are for no fewer than five aircraft. You get two Bulgarian options, two Italian and an early Vichy French option that is for an Aeronaval unit. The decals, which I have darkened to show the white, are nicely done and should work well with no issues. Markings and painting info for two options are on the back of the box with the other three sharing a sheet with another kit. Generic names are provided for all of the colors. 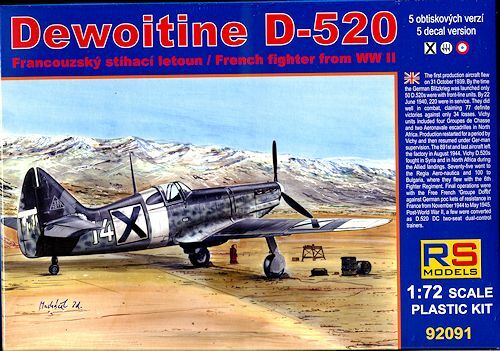 Now that we have a choice of decent 1/72 D.520s (the old Frog kit is not included), the question is 'which one to choose'. 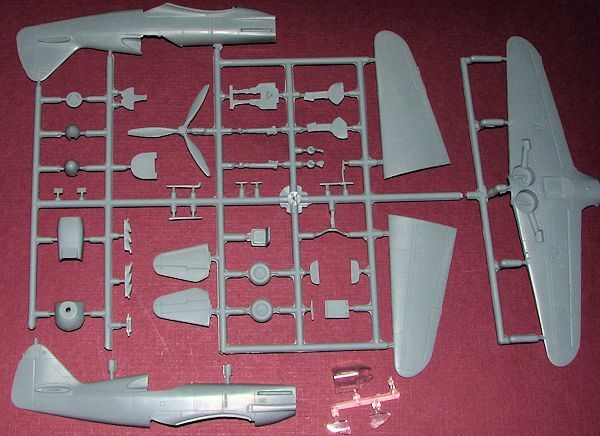 I anticipate that the Hasegawa one might be easier to construct just because it is a bit more basic in terms of parts. The RS one, however, doesn't look all that bad and provided improved detailing over the Hasegawa kit. Both of them are not inexpensive and you do get thinner decals with more options with the RS Models kit. I plan on building this one (of course, I plan on building a lot of kits), so the telling will be in the doing.